Lynch is the former CEO of Pandora and was a founding CEO of Dish Network’s Sling TV. Roger Lynch T’95 will deliver this year’s Tuck Investiture address on Saturday, June 8. Lynch will be joining Tuck during an exciting time in his career. Just last week he was named the first global CEO of Condé Nast, a media company that produces world-renowned content and reaches more than one billion consumers in 30 global markets through its print, digital, video, and social platforms. The company’s large portfolio includes many of the world’s most iconic and influential media properties, such as The New Yorker, Vogue, Vanity Fair, Bon Appétit, GQ, and Wired, among others. Lynch’s new appointment follows his successes at Pandora and Sling TV—industry-shaping companies that have helped transform the digital media landscape. As Pandora’s CEO, Lynch led the turnaround of the largest streaming music service in the U.S. and its successful acquisition by SiriusXM earlier this year. Prior to Pandora, Lynch served as founding CEO of Sling TV, which he grew into the number one Internet television service in the nation. Lynch’s success at the intersection of technology and media in the United States followed an equally impactful career in the United Kingdom, where he served as CEO of Video Networks International Limited, a leading Internet protocol television provider, and Dutch-based Chello Broadband. Lynch began his post-Tuck career as an investment banker with Morgan Stanley, where he specialized in Internet, technology, and media corporate finance. Lynch’s leadership activities also include his service on the boards of Mattel, Inc.; of Quibi, Jeffrey Katzenberg’s new mobile streaming service; and of the University of Southern California’s Dana and David Dornsife College of Letters, Arts, and Sciences. Tuck has long benefitted from Lynch’s wisdom and counsel through his dedicated service on its Board of Advisors and Campaign Leadership Committee. 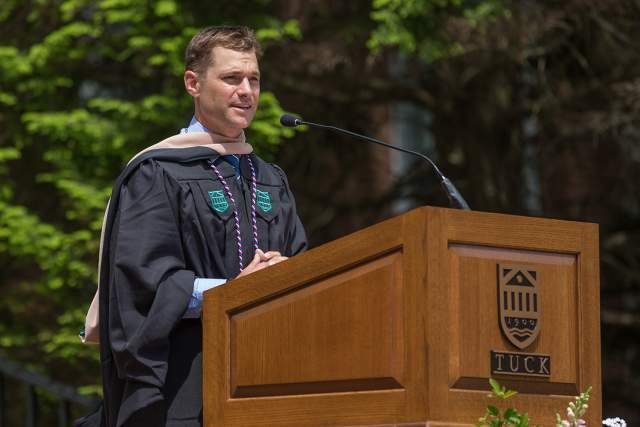 In addition to earning his MBA from Tuck with highest distinction, Lynch also holds a bachelor of science in physics from the University of Southern California. 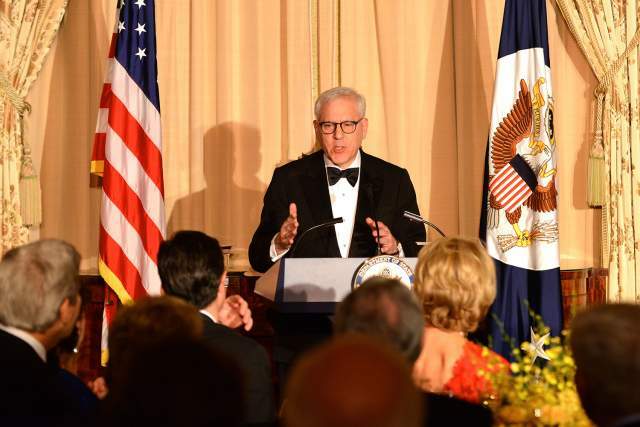 Rubenstein co-founded one of the largest private equity firms in the world, The Carlyle Group. Dave Dauphinais T’18, a former Navy Seal, reminded his fellow classmates about the importance of strength during this year’s Investiture ceremony.